Bullets, once fired, have their own stories to tell. In their unique signatures—the tiny markings, the tell-tale dents. Not very long after the assassination of journalist-activist Gauri Lankesh on September 5 last year, a piece of ballistic evidence—a vital part of the vast and complex jigsaw puzzle of conspiracies and murders—was seen by investigators in Karnataka as a link to the killing of rationalist-writer M.M. Kalburgi, who was gunned down in 2015 in Dharwad, more than 400km from Bangalore. Kalburgi’s killing, it is suspected, is further connected to the identically-executed murders of two other rationalists, Narendra Dabholkar (2013) and Govind Pansare (2015), in Maharashtra. Gauri Lankesh, editor of the Kannada weekly Gauri Lankesh Patrike and a strident critic of the RSS-BJP, was shot dead by two assailants on a motorcycle outside her home in Bangalore. A year later, the trail of a network of radical Hindu right-wing operatives that investigators in Karnataka have been piecing together now appears to be widening, and their paths criss-crossing. All through last week, the action shifted to Maharashtra where the Central Bureau of Investigation (CBI) arrested Sachin Andure, the alleged killer of Dabholkar. The CBI last week told a Pune court that it is probing links between Andure with some of those arrested in the Lankesh case. Here’s how the events unravelled: on August 10, the Maharashtra anti-terrorism squad (ATS) arrested Hindutva activist Vaibhav Raut of Nalasopara town near Mumbai and two others, Sharad Kalaskar and Sudhanva Gondhalekar, and seized a large cache of explosives and arms. Kalaskar’s interrogation, police say, led them to Andure. The paths of the killers criss-cross, say police, as they point to the arrests of suspects Sachin Andure (left) and Virendra Tawde. The backlash came from various quarters: there were protests in Nalasopara over the arrest of Raut who ran a cow protection outfit even as the Sanatan Sanstha—opposition parties in Maharashtra, NCP and Congress, have stepped up the demand for a ban on the outfit—denied it had links to the people arrested for the murders. “But they belong to different Hindu organisations. There are over 320 Hindu outfits across the country. So how can someone say that they all belong to Sanatan Sanstha?” Chetan Rajhans, a spokesperson of the organisation, was quoted by PTI as saying. As things stand, the country-made guns seized in the recent arms haul are of interest in the Lankesh case. The special investigating team (SIT) in Bangalore suspects that the 7.65mm pistol used to kill Lankesh was transported to Maharashtra by Gondhalekar who picked them up from a safe location in Bangalore after her murder. This weapon, they say, was the same that was used to shoot Kalburgi. The basis for this claim is that forensic analysis of the bullets recovered from the victims’ bodies show identical markings—the indent from the firing pin, the groove caused by the extractor and lastly, the striations on their surface. Indications are that leads from the Lankesh investigation may also prove useful in the Kalburgi probe, which had hit a dead-end. “We have given specific inputs about the Kalburgi shooter,” says an SIT officer. Kalburgi, a Kannada scholar and academic, was shot at the doorstep of his house in the north Karnataka town of Dharwad on the morning of August 30, three years ago. The leads from the Gauri Lankesh investigation may prove useful in the M.M. Kalburgi probe that had hit a dead-end. So far, the SIT has arrested 12 men in the Lankesh murder against whom it recently invoked provisions of the stringent Karnataka Control of Organised Crime Act. One of the central figures in the conspiracy, police claim, is Amol Kale, a Pune resident, whose arrest in June led the SIT to infer that several other prominent people were on a hit list. Investigators claim to have found the names of 37 individuals on his diary, including 15 from Maharashtra and eight from Karnataka. The diary’s contents provided clues to other suspects in the case, who were picked up subsequently. In all, there are about 50-60 people in Kale’s network, according to an investigator. Since the arrests, some pieces of the murder plot have emerged, including the detail that the group’s plan to kill Lankesh on September 4 was foiled when she returned home earlier than they expected. She was shot dead the next day around 8pm when she had just driven back home. The SIT has accused Parashuram Waghmore from Sindagi, a town in Karnataka’s Bijapur district of pulling the trigger on the journalist and named Ganesh Miskin, a Hubli resident, as his partner who drove the bike. After the murder, the duo rode some distance away to a waiting van (brought by two accomplices) into which they dumped their clothes and the guns (Miskin too was armed, police claim) before leaving to a safehouse on the city’s outskirts. A local man, Suresh, stashed all these articles in his house in another part of the town while the guns were hidden in a shop he had rented out. Police suspect, Gondhalekar came to collect the guns later. Among the 12 arrested by the SIT is Rajesh Bangera, a government employee in Kodagu, who is alleged to have given arms training to several people over the years. Some of those arrested, including Waghmore and Miskin, were suspects in communal clashes in Karnataka before. The SIT made their first arrests of Kale and five others when they were planning an attack on Kannada writer K.S. Bhagwan—one of the eight people from Karnataka whose name, police say, was on Kale’s hit-list. The SIT says the group tried to cover their tracks at every step: they carried out detailed recce of their targets (a check-list of things to account for while surveying was among material seized from one of the suspects), they used codes for each member, communicated through public call booths and multiple SIM cards and apparently didn’t use smartphones. 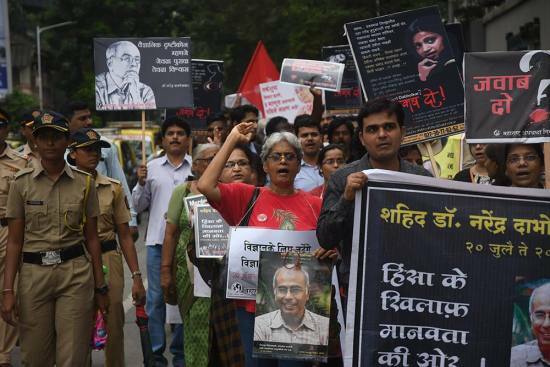 “There’s quite a bit of evidence on record now which links all these four murders and which clearly indicates that this was a very well thought-out and well-planned conspiracy executed in cold blood,” Hamid Dabholkar, son of the slain rationalist, says. The first arrest in the Dabholkar case—that of Virendra Tawde—was made almost two-and-half years ago. “It is high time now that they should go to the root of the conspiracy and reach the masterminds,” he says.